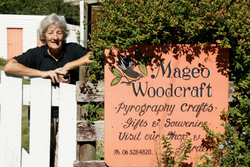 In Apiti, you will find Mageo craft, including pyrogaphy, art work and a cottage garden. Mavis and George (that’s where the name Mageo originated from!) have worked together for years creating a wonderful cottage garden and building up a gallery of pyrographed art, New Zealand souvenirs and gift items. Pyrography is the ancient art of wood burning or pokerwork. You will have an opportunity to watch Mavis at her creative work and view the quaint gallery, which also displays her gift of painting. The below photos of the garden were taken early autumn. Open anytime by arrangement, preferably phone first.